UAC (User Account Control) is another Microsoft workaround in their never-ending battle with hackers as Microsoft tries to keep us Windows users safer. But turning off UAC isn’t a good idea. But we all know too well how those UAC prompts can get annoying. There’s a little program (339 KB) that can tame UAC for you without having to turning it off. 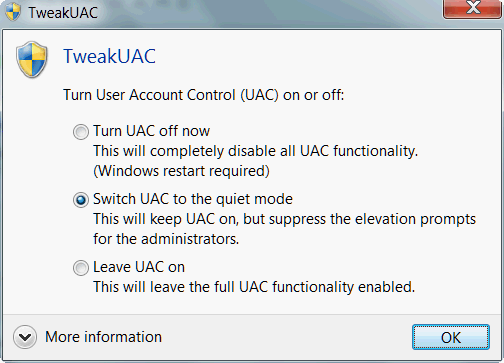 Tweak UAC works with Windows Vista, Windows 7, and Windows 8, both 32bit and 64bit versions. Read more about Tweak UAC from its home page, but be sure to download it from Major Geeks, or you’ll have to join Winability’s mail list to download it. Here is the direct download link. Also note that Major Geeks has not updated the operating systems on which Tweak UAC runs; according to the author of the program, it works on Windows Vista, Windows 7, and Windows 8, both 32bit and 64bit versions. We have tested it on Windows Vista 32bit, Windows 7 64bit and Windows 8 64bit and found it works well on all three. After you download and install Tweak UAC, open it and “Switch UAC to the quiet mode” option. This will prevent some of those annoying UAC warning prompts — and a lot of clicking. Don’t forget, for product information use this link. To download the program, use this link. OK?